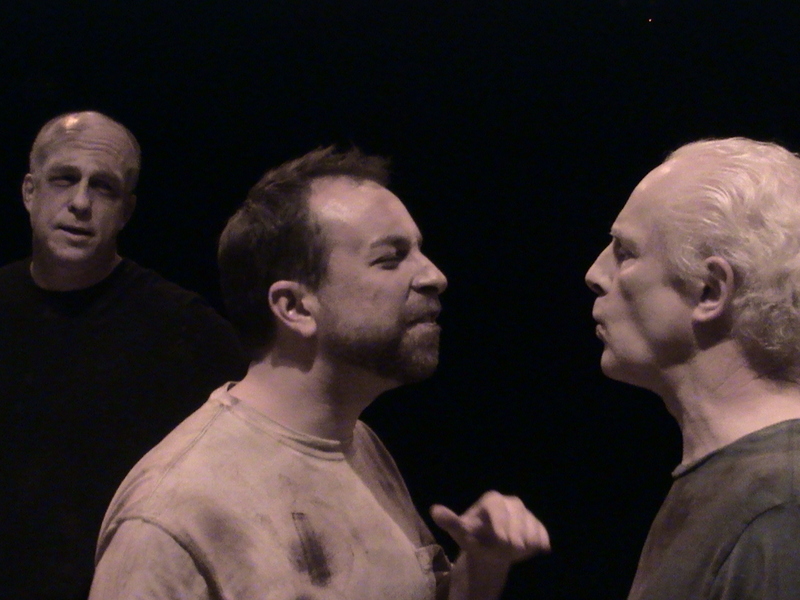 (left to right) Dan Walker as Adam, Lou Colaiacovo as Michael and Vincent O’Neill as Edward. Photo: Brian Cavanagh. At first glance, Frank McGuinness’ Someone Who’ll Watch Over Me might seem like a claustrophobic play. After all, the entire scenario takes place in a prison cell in Beirut, Lebanon, with all three members of the cast chained to the wall. In the Irish Classic Theatre Company’s (ICTC) recent reprise of this 1992 play, the feeling is anything but cooped up. In fact, it’s quite amazing what an American, an Irishman and an Englishman can drag into a tiny room—history, humor, the potato famine, their mothers, the list goes on. McGuinness’ play is set sometime during 1989 in an unnamed war on terror. We never find out exactly what Adam, the doctor, Edward, the journalist, and Michael, the English teacher, did to deserve imprisonment, which shifts the focus from politics to personal relationships. They write imaginary letters home to their families, tell stories, and engage in a hilarious re-enactment of a Wimbledon tennis match to keep themselves mentally intact. McGuinness plays tennis with our emotions as well, bouncing from despair to vaudeville hilarity. ICTC’s artistic director Vincent O’Neill bestows the cantankerous but vulnerable Edward with a robust performance, belligerent at times, and off the wall funny too. Dan Walker brings a generous quality to Adam, the play’s most sensitive character. His spellbinding performance of “Amazing Grace” makes for a potent breathing moment in the evening. Louis Colaiacovo takes Michael, the Brit, on the longest emotional arc, traveling from mother’s boy to sole survivor with a unsuspecting noble grace. Director Greg Natale lets the lively language rule. It’s a play more about what we hear than what we see. Natale gets that, and keeps the action spare so that the power of the trio’s imaginations take center stage. Ron Schwartz’s clean set consists of a bare bones cement cell, designating their limited quarters, and tightly containing the vastness of the drama. Brain Cavanagh’s lighting design is particularly sensitive to the piece’s quietude, amplifying its most poignant moments. In the end, it becomes apparent that it’s not a play about imprisonment at all, but the power of human connectivity to withstand the most difficult of circumstances. The play concludes on a surprising note, unresolved, but riveting nonetheless.